There are about 200 coastal cabins still standing, with Era being the largest community of the Royal National Park cabins. Most were built in the first half of the 1900s, many during the Depression era. Unless you catch the once-a-year Royal National Park Cabins Open Day, the photos below are your only chance to see inside these pieces of living heritage. Everything you see was carried in by hand down a bush track. This is why you'll spot many kerosene fridges despite the technology becoming redundant. The flag of the Coastal Cabins Protection League (pictured above) was designed by Australian artist, and cabins regular, Reg Mombassa (also known for his Mambo designs and member of band Mental As Anything). Cabin number 88 deserves a special mention as it's generally accepted to be the first Royal National Park shack dating back to 1910. Originally built for an Aboriginal stockman, known as Old Tom, the basic shack earned its “88” in 1953 when numbering was introduced. The most direct way to get to the Royal National Park cabin community of Era, is to drive to Garawarra Farm car park then walk via a steep 2.5km descent on a bush track. If you think that's tough, just think of the shackies who have to carry food, supplies and building materials up and down there each time they visit. Since this car park is also the best entry point to get to the popular Figure 8 Pools, it can get pretty busy. Pay the standard national park entry fee at the parking machines and display the ticket on your dashboard. Heading down the Burgh Track to the cabins. Garawarra Farm Road, off Garie Road, is unsealed dirt with a few potholes but there’s no need for a 4WD. As you drive into the carpark at the very end of the road, you’ll see a locked gate in front of you. On the other side there’s a walking track on the left with a sign saying “Garawarra Farm”. Follow this until you get to a grassy ridge (ocean still in front of you) with an un-signed track leading off to the left. Turn left here, and wind down to the Era cabins. The track takes you past some of the shacks, but others are tucked away off the main Coast Track. You're free to explore – after all this is public land – but please respect the serenity and personal space that attracted the “shackies” here in the first place. 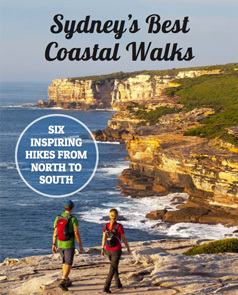 You can also access the Royal National Park cabins while walking the Coastal Track. If going from Bundeena to Otford, you'll walk past the Era cabins on day two (Stop 9 on the Coast Track Map). Enjoyed these photos? Have a look at Little Garie, another community of the Royal National Park cabins. There's an annual open day for the cabin communities, with a free guided walk put on by the “shackies”; check out details for this year's Royal National Park cabins Open Day. Tagged Cabins, History, Royal Coast Track, Royal National Park.